Dia de los Muertos is a holiday observed in Mexico on November 1st and 2nd, where people celebrate the lives of those that have passed away. 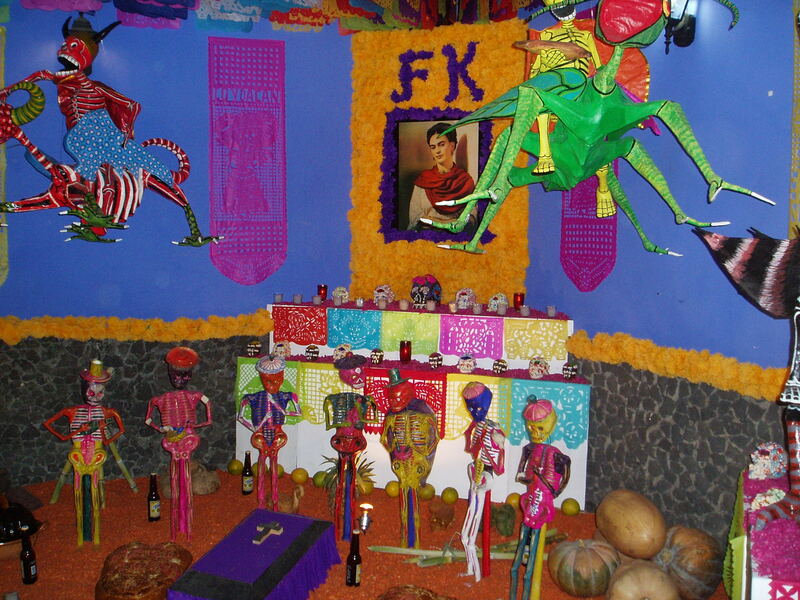 Altars are set up everywhere in honor of the dead; food, alcohol, cigarettes, pictures, and anything else that the dead may have liked are set out as an offering, for this is the time that the dead will likely visit the living. 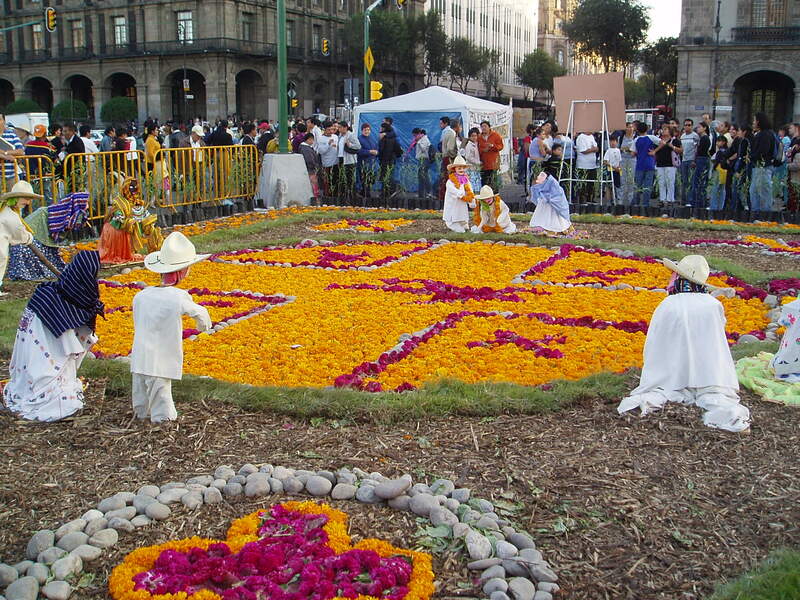 Sugar skulls are everywhere, as are mariflores- golden flowers- and paper picado, or thin paper cut in elaborate designs. Little scenes of calaveras, or skeletons, depict everyday occurrences of the dead, such as playing the guitar, drinking a beer in the cantina, or a family eating dinner. Generally, November 1st, or All Saints’ Day, honors children who died prematurely, and therefore innocently. November 2nd observes everyone adults, and is known as All Souls’ Day. This holiday tradition has spread to other countries, and is celebrated in the US where there is a large Mexican-American population, such as Los Angeles and San Jose, California. Similarly, Halloween is now celebrated in Mexico, and so the three day holiday is definitely something to observe. I was lucky enough to be in Mexico in 2005 during this time, traveling around backpacking, and definitely had a feast for the eyes. 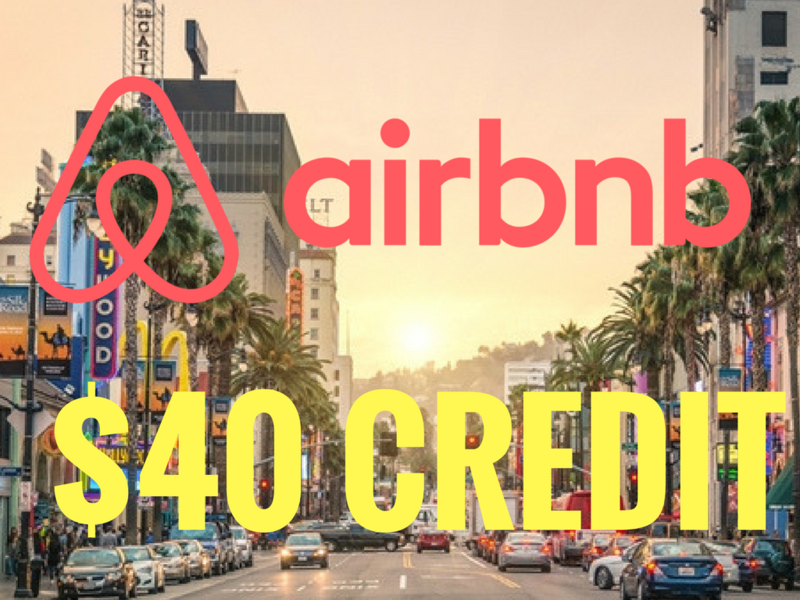 I wanted to go to the island of Pátzcuaro in Michoacan, but due to its popularity and last minute planning, I wasn’t able to book any kind of accommodation. Nonetheless, I was in Mexico, and my friend Denise, who is a native of Toluca, was able to show me around her hometown and Mexico City. 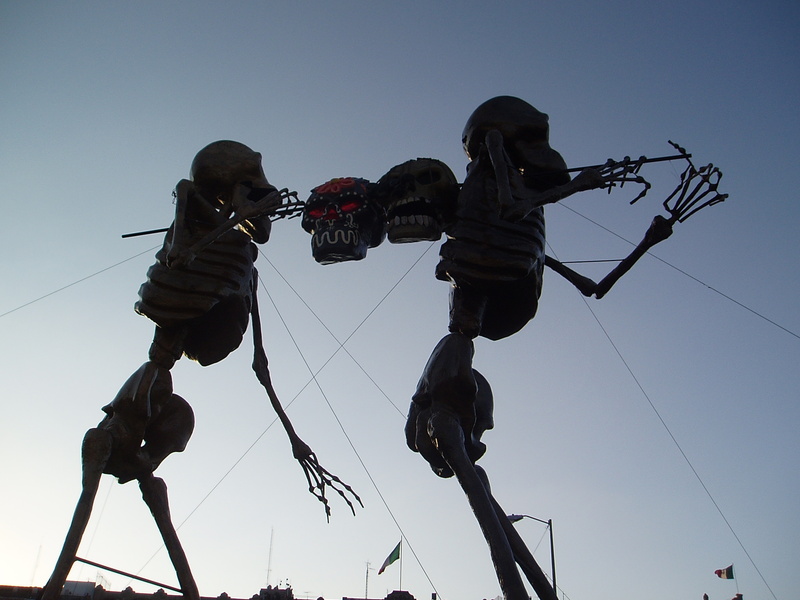 In Toluca, Denise’s family and I went to the downtown area, where everyone was preparing for the Day of the Dead. 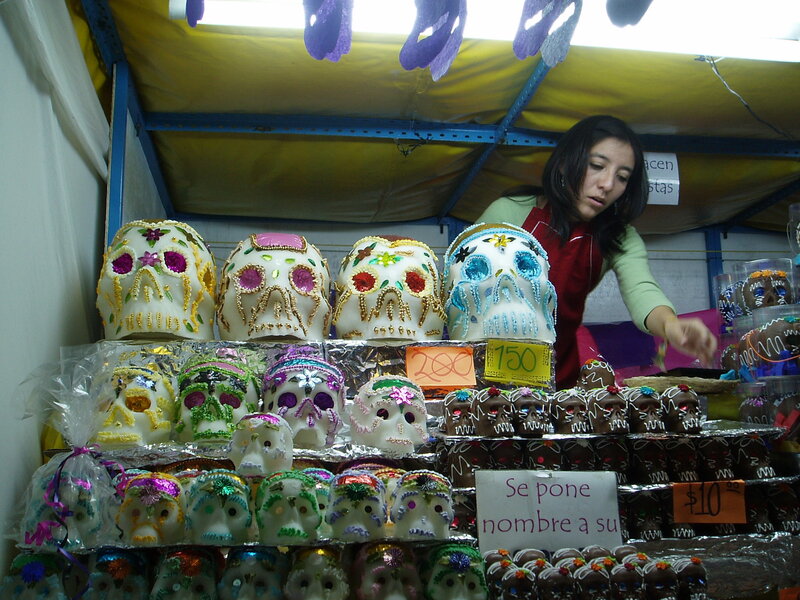 While there was an array of candies, flowers, pan de muerto, and calaveras for sale, the thing that struck me was the amount of sugar skulls for sale. From tiny ones the size of a golf ball to life-size ones and bigger, you could get the skulls made out of sugar or chocolate. The art decorating the skulls was even more impressive and varied. People would buy the skulls for their altars, having the name of their deceased loved one written on the skull. On the day of the dead, the family would get together and eat the candy. 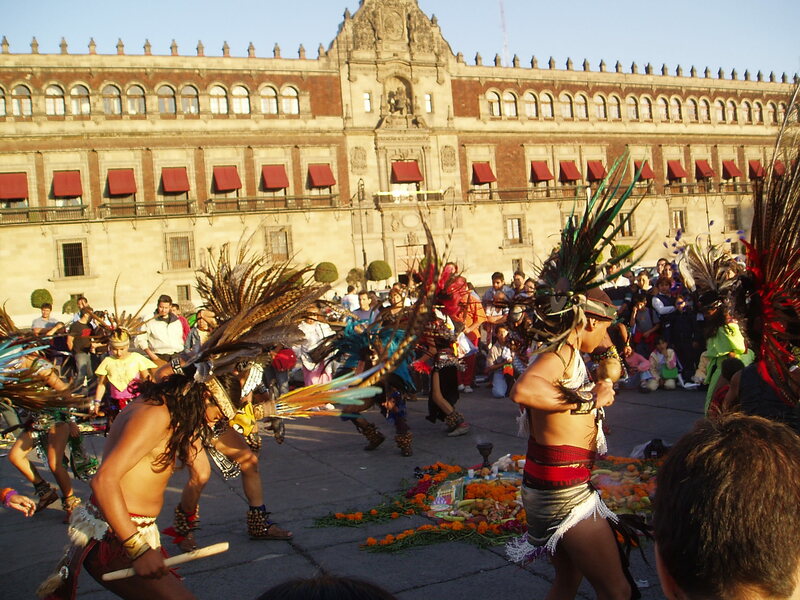 When we were in Mexico City, or DF as it is known to locals (after Distrito Federal, or Federal District), we went to the Zócalo in the historic center, where there was a days-on-end festival going on. 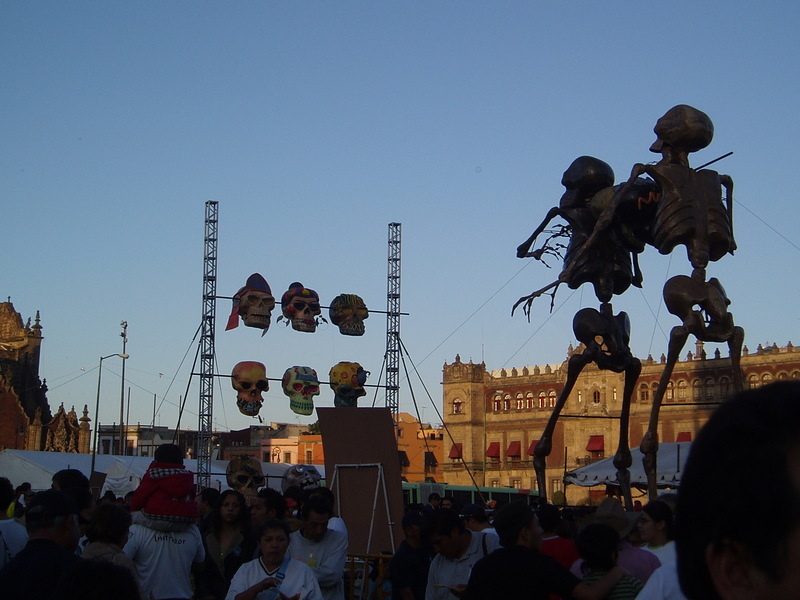 There was a stage set up for various musical acts, and huge, elaborate displays were set up in honor of Dia de los Muertos. 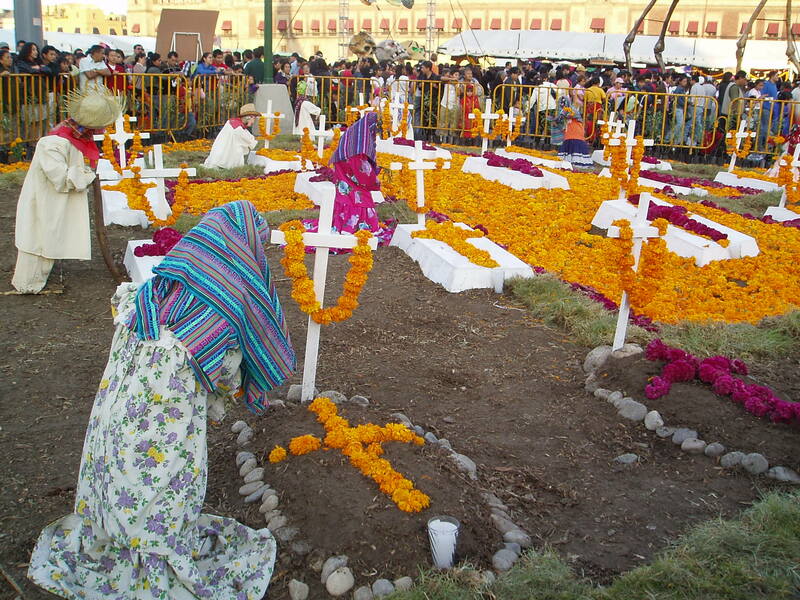 15+ foot calaveras posed in march across the plaza, sheet-draped figures prayed over crosses and flowers, skulls hung everywhere, and people everywhere had their faces painted like a skeleton’s. Art was everywhere- still and moving- and it was one of the most spectacular scenes I’ve witnessed. Curanderos, or witch doctors, offered spiritual cleansings, old women sold candy of every kind, Mexican hippies sat on the floor selling their artesanias, and dancers in native Aztec dress performed well into the darkness. Love, longing, and reverence for those passed hung in the air as we all reveled in the haunting beauty of life. *All photographs are my own, and copyrighted as such. Please contact me if you would like to reproduce them in any way. Thank you. Thanks for reading! 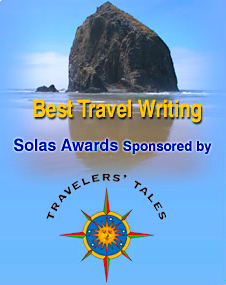 I’m always interested in others’ travel journeys, too, especially when I can’t travel. 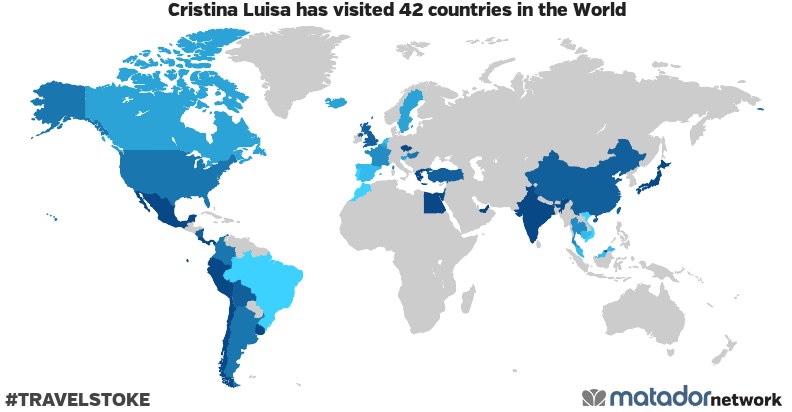 What is your favorite travel show? I recently started watching Anthony Bourdain’s “No Reservations” and quite like it.